Not everyone wants to be a superhero. But sometimes life just doesn’t go as planned. The Big Hero Team is a superhero group from San Fransokyo. The team consists of Hiro Hamada, Baymax, Wasabi, Honey Lemon, Go Go Tomago and Fred. The Big Hero 6 superhero team came into existence to capture Yokai, the super villain (the man responsible for the death of Hiro’s brother Tadashi) and bring him to justice. 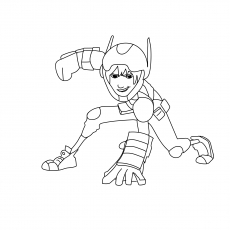 Hiro, the leader of the group, built specialized suits based on the skills of each member and transformed them into high-tech superheroes. After defeating Tokai, the superhero team pledged to protect San Fransokyo in the honor of Tadashi. Here’s a cute coloring image of Baymax, the deuteragonist of te movie. This plus-sized healthcare robot is a member of the Big Hero 6 superhero team. Baymax was created by Tadashi Hamada to provide a robot nurse to the citizens of San Fransokyo and improve healthcare around the world. 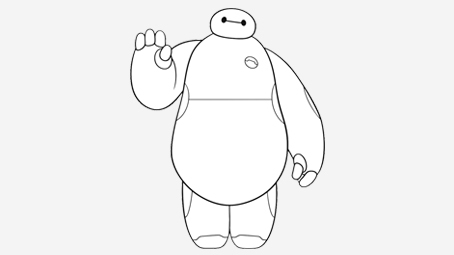 As a healthcare robot, Baymax is extremely caring for his patients. With just a simple scan, Baymax can detect even the vital stats. And by observing just the patient’s level of pain, he can treat nearly any ailment. To improve his overall personality and provide him with programming, Baymax was also given a special chip that makes him the lovable robot he truly is. Without the chip, Baymax is an entirely different being. Baymax’s structure looks just like a snowman, or as he is fondly dubbed, ‘a big marshmallow’. He has a small, badge shaped access port placed on the left corner of his chest. This port contains all the four cartridge chips required for programming. His body is even equipped with a heating system that can warm anyone lying on him. 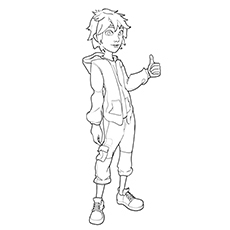 Hiro Hamada, the protagonist of the film, is the founder and the leader of the Big Hero 6 superhero team. It’s believed that Hiro Hamada is based on the character Hiro Takachiho from the Marvel comic series of the same name. Hiro Hamada is a young fellow with an intellect far beyond his age. He may appear cocky and brazen due to his extreme intelligence, but never to the point of being annoying. Initially, Hiro spent much of time using technology to win money through illegal fight bet, much to the disapproval of his elder brother Tadashi. Despite the bold nature, Hiro has a soft side to him, observed in his shy behavior in front of the crowds. But he became all matured after the death of his brother. 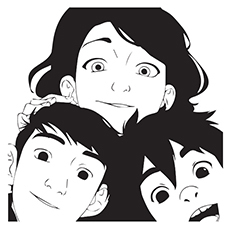 Here’s a big hero 6 coloring page of Tadashi Hamada with his younger brother Hiro and Aunt Cass. Tadashi Hamada was a talented robotics student at the San Fransokyo Institute of Technology under the guidance of his mentor Professor Callaghan. He was also the creator of Baymax, his Personal Healthcare Companion robot. Tadashi was an epitome of a great brother. He cared a lot for Hiro and even tried to convince him to use his gifted intellect for doing greater things for the society. He wanted to create a technology that could change the world and needed Hiro’s help in his endeavor. Tadashi’s sudden death in a mysterious fire gave way to the rest of the events in the film. Hiro and Tadashi’s best friends join to investigate the accident and unfold the truth. Go Go Tomago is another major character from the movie. She is a mechanical engineering and industrial design student at the San Fransokyo Institute of Technology. Go Go may look headstrong and stoic, but is loyal to the bone. As compared to the rest of the friends, Tomago is not much of a conversationalist, but makes up for it with her sarcasm and bluntness. She even has uncompromising values and a strong code of honor, seen when she was the first to stand up to Hiro in his desire for vengeance. 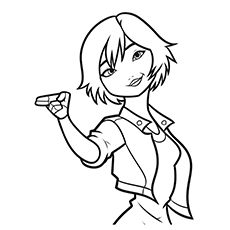 Go Go Tomago is a tall girl, with fair skin, pink lips, brown eyes and scruffy brown hair with blue streaks. Here’s a coloring image of Baymax in his superhero form. In the superhero avatar, Baymax is upgraded into a purple and red protective armor. 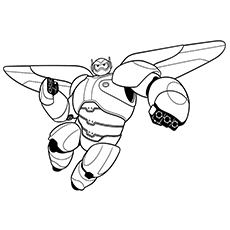 In this form, Baymax gets the ability to fly, with the help of his back-mounted wings and two rocket thrusters. He can even fight, all thanks to the reinforced durability that he gets from the armor. The armor is even flexible in the sense that it possesses tremendous strength while being sleek and lightweight in design. His helmet gives him the ability to tackle and find people using only their medical information like heart rate or body temperature. Baymax also turns into an extremely powerful robot in his superhero avatar. It’s stated that he can lift 1000 pounds, which he has even demonstrated a couple of times. The cute, bubbly girl you see here is Honey Lemon, a talented and chemical engineering student at the San Fransokyo Institute of Technology. Honey Lemon is as sweet as her name. She is outgoing, humorously photogenic and funny. She loves taking photos of herself and even grabs her friends for a group photo whenever they go to some interesting place. Honey Lemon may not appear, but is tremendously intelligent. She can calculate the types of chemical substances at incredible speeds even without looking at the Typepad. She has an extreme love for danger and even sudden, and surprising events cannot slow her down. It can be demonstrated by the fact the she is always mixing volatile substance, unfazed by the dangers. 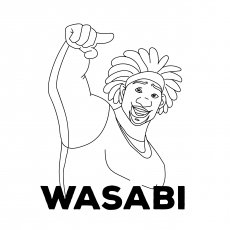 Wasabi is another member of the Big Hero Superhero Team. This intelligent young man is an outstanding student of applied physics at the San Fransokyo Institute of Technology. Out of all the people in his group, Wasabi is the most grounded of all. He even appears to be the one with the most common sense revealed in the film when he found Hiro’s plan to form a superhero team to thwart a masked man insane. In reality, anyone would find such an idea ridiculous. He even gets nervous and scared when faced with stressful situations. Due to these traits, Wasabi is considered a ‘chicken’ by other members. In short, Wasabi is a ‘by the book’ kind of person, who believes in using law and order for the proper functioning of the society. Meet Fred, a young, comic book enthusiast with a slightly insolent, yet lovable personality. Fred is the child of a wealthy couple who are often away in their private isles, leaving Fred under the care of their loyal butler Heathcliff. In San Fransokyo Institute of Technology, Fred works as the school’s mascot while entertaining his passion for science. At the school, Fred spends most of his time with his close buddies, Honey Lemon, Wasabi, Tadashi, and Go Go Tomago. Fred has a laid back personality. You will always see him sitting back and looking at the brighter side of the things, even when faced with danger. He also makes witty remarks, no matter what is at the stake. 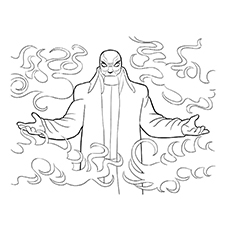 Yokai, also known as Professor Robert Callaghan is the antagonist of the movie “Big Hero 6.” He was the mentor of Tadashi Hamada and the head of the San Fransokyo Institute of Technology’s electrical department. Initially, Professor Callaghan, the world-famous scientist was a very inspiring man. He was praised for his innovation on the foundation of robotics and the creation of Callaghan’s Law of Robotics. Yokai loved his daughter Abigail more than anything else in the world. Unfortunately, during an experiment, a malfunction occurred, and Abigail was lost in the portal, later presumed to be dead. The tragedy left the professor stone hearted, eventually descending into villainous madness. He abandoned his identity and took the mantel of Yokai. 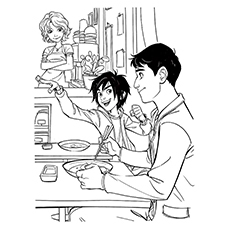 This big hero 6 coloring pages to print features Aunt Cass with the Hamada brothers, Tadashi, and Hiro. 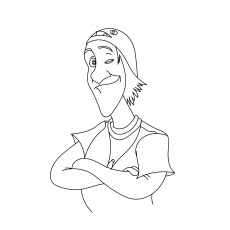 An owner of San Fransokyo bakery and coffee shop, Aunt Cass is very supportive of her nephews Hiro and Tadashi, just like a mother figure. In fact, she loves her nephews above everyone else. Aunt Cass even tries her best to help Hiro come out of the depression after the death of Tadashi. She is eccentric, and absent-minded, seen how Hiro was able to hide Baymax’s existence from her. Cass Hamada is a slender, fair-skinned woman with green eyes and frizzy brown hair. Mochi is a plump and small Japanese bobtail cat with black, brown and white fur. He wears a green collar with a bell around his neck. Mochi feels very scared of Baymax. 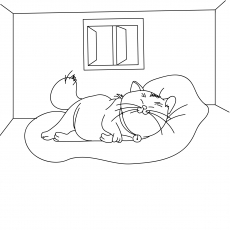 He first appears in the film rubbing and purring around Hiro’s leg while trying to hide Baymax. But when Hiro throws him up in the stairs, Baymax catches him and gives him the name “Hairy Baby”. As for the personality, Mochi is a very cute, sweet and affectionate cat. The Fujitas are a group of female criminals from the high-tech city of San Fransokyo. These cunning girls were supposed to serve as henchmen to Mr. Yama, the original mob boss in the city’s underworld. Mr. Yama was designed to serve as a principal antagonist in the film but eventually diminished into a comic villain. 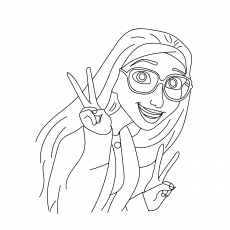 Honey Lemon is an optimistic team member who keeps everyone in the group smiling with her one-liners. In the superhero form, Honey Lemon does not wear glasses. Instead, she wears a purple helmet with orange highlights. Slung over the shoulder is her purse, with a mini chemical lab for combat. It even contains a touch screen that has an encoding of the periodic table that she uses to create weapons. The purse strap is basically a string of empty capsule made of advanced polyethylene shell. 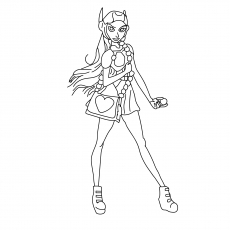 Honey Lemon’s superhero consists of a light purple dress with dark magenta sleeves and leggings, while linings, pink armor, and purple platform heels. Fred’s superhero heritage comes from his father’s bloodline, who was also a superhero before his retirement. 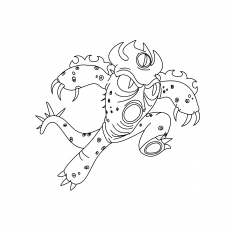 Since Fred was a fan of all the things monstrous and fanatic, he was given a battle suit that made him look like a traditional Japanese Kaiju monster based on Kroger. His battle suit enables him to spin at high speeds. The orange and blue beast has black, claw-like nails, three eyes, a tail and four-fanged mouth. The suit’s soles enable him to perform high jumps. There’s a flamethrower installed below the chest. The suit is also flame resistant. 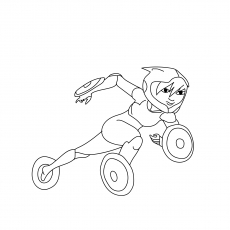 This daredevil junkie is best on wheels, and when she joins the superhero team, she rolls like no other thing, using the maglev discs. Go Go is very adaptive and resourceful, with or without the powers. Her battle suit is based on the experiment during her introduction at her institute. With the use of her mechanical engineering, Go Go created a bike with exceptional speed. This was incorporated into her suit. In her superhero form, Go Go wears a yellow and black suit of armor with a matching helmet, yellow maglev discs on the boots, wrists, and black under clothing with red linings. With the suit, Go Go gets impressive velocity, speed and agility. Go Go can cause the discs to become incredibly powerful and heating, enabling her to cut through the hard objects at an exact momentum. 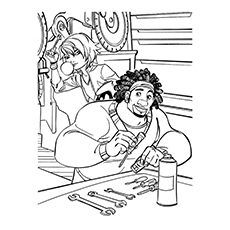 This big hero 6 coloring page features Wasabi and Tomago working on their project. Go Go and Wasabi do not get along well with each other. While Go Go is robust and straightforward, Wasabi is a lazy and frivolous. Due to extreme dedication to the tasks, Go Go has little patience for people who move at a leisurely pace, especially Wasabi. It was even shown during the car chase scene, when tired of Wasabi’s ‘by-the-book’ driving, Go Go takes the steering to help the team evade Yokai. Go Go and Wasabi’s tiff provide comic relief in the film. 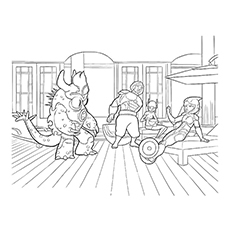 This coloring page features Wasabi in his superhero avatar. 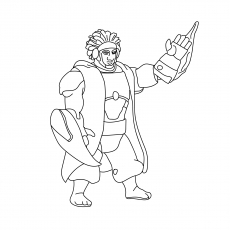 Just like the rest of the team members, Wasabi’s abilities are based on his college project- laser induced plasma, which provides him with natural physical strength. Even his suit contains a pair of plasma blades housed in the arms. These razor sharp blades can slice through most of the material with ease. Wasabi even appears to be the most influential member of the team, seen when he used his physical agility and plasma blade to counter all of Yokai’s attacks. Even his reflexes are very quick, which is shown during the training. In the superhero avatar, Wasabi dons a turquoise blue armor paired with blue Japanese crop pants and a shimmering cape. 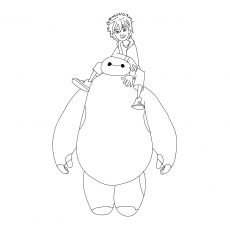 Here’s an adorable coloring page of Baymax hugging and comforting Hiro after the death of Tadashi. Following the death of Tadashi, Hiro accidently stubs his toe, giving out a cry, which summons Baymax. Baymax greets Hiro and tries to tend his wound. But Hiro, already upset with the death of his father, tries to get rid of Baymax, finding him annoying. Baymax then informs Hiro that he has to use code words to deactivate him. Hiro repeats the code words and even tries to push Baymax into the idle state, but slips him in the midway. While falling on the floor, Hiro stumbles on one of the Microbots. Thinking the device is defective, Hiro discards it. Baymax then notifies Hiro that the bot is trying to reach a destination. Hiro orders Baymax jokingly to follow the bot and he does exactly that. The duo then enters the warehouse and stumble across a hoard of microbots. The microbots even attempt to attack Hiro and Baymax, but tey escape. Hiro then realizes that the culprit is Yokai. Here’s a coloring image of Hiro in his superhero avatar. Hiro’s superhero suit is indigo and black in color with red accents. The black clothing underneath his armor covers up most of his body, up to the knees. Hiro’s armor does not have any superpower; his real power lies in his mind. Hiro’s intelligence helps him create new inventions and concepts. However, the red magnetic pads on his armor assist in transportation. The magnetic pads help him hold onto Baymax while taking flight. His helmet is equipped with a communication device that helps him contact with the rest of the team members despite the distance. 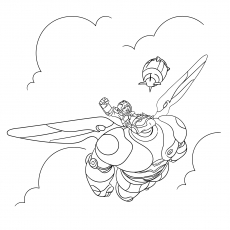 This big hero 6 coloring page features Baymax and Hiro flying high through the city. The upgraded version of Baymax gives him wings and rocket boosters that allow him to fly high. The back of Baymax’s armor is equipped with magnetic extensions that allow Hiro to ride on top of his back, without the fear of falling. After the death of Tadashi, Hiro and Baymax hatch a plan to avenge his death. Baymax and Hiro go underground to prepare for the battle, but are interrupted by the arrival of Tadashi’s friends. Baymax had contacted Tadashi’s friends to help cheer Hiro. The noise made by the arrival of Tadashi’s friends alerts Yokai’s attention and he starts attacking, throwing loads of cargo in the hope of crushing them. But his motives were foiled by the protective Baymax. As the team retreats to Wasabi’s van, Baymax stays put to battle Yokai. Unfortunately, Baymax meets his defeat rather quickly, having knocked onto Wasabi’s van. The team then tries to escape Yokai, but Yokai pursues them hastily. During the chase, Baymax saves Hiro from falling out of the van. The team eventually escapes by falling into a bay, making Yokai believe that they are dead. 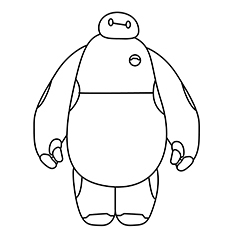 This cooling big hero 6 coloring page shows Baymax attempting to pick up a soccer ball. Baymax loves playing with a soccer ball. After meeting Hiro, Baymax begins to change. He picks up human emotions and tendencies, including Hiro’s love for soccer. 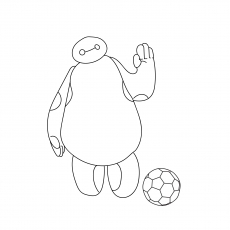 Whenever Baymax gets some spare time from nursing, he plays soccer. He does not even need any partner for playing the game. Whenever time permits, Baymax picks up his soccer ball and starts playing. The superhero team was tired fighting Yokai, so are now taking rest. But where are Baymax and Hiro? Go Go, Honey, Fred, and Wasabi had arrived at Tadashi’s house to pay condolence to his brother. But a masked man attacks them as they try to flee in the car. The group, along with Baymax and Hiro lands in the water. The group was nearly drowning, but Baymax floats them to the land. Hiro and Tadashi’s friends realize that Tadashi’s death was not an accident, but a preplanned murder. The group then bands to avenge Tadashi’s death. Here’s a lovely coloring page of the film logo. Children can either use a single shade to paint the logo or give it a multi-color. A combination of red, white and black would also look beautiful. These activity sheets will keep the kiddos busy for hours. 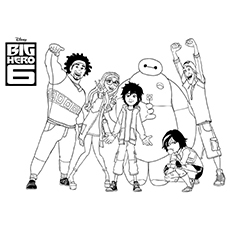 Whether it’s a Big Hero 6 themed party, an at-home movie night or some daily fun, these “Big Hero 6” coloring pages are sure to be a huge hit with children. Has your kid watched the movie “Big Hero 6”? How did your kid like it? Share with us by commenting below!